Prototype: German Federal Railroad (DB) 2-unit diesel powered rail car consisting of a class VT 75.9 motor car and a class VB 140 trailer car, 2nd class. Crimson basic paint scheme. The engineer's areas on the motor car have sunshades and a curved warning horn at both ends. Roof version for the motor car with separately applied roof coolers as well as supply and drain pipes and auxiliary control rods. The motor car and trailer car have older design buffers. Road numbers VT 75 902 and VB 140 042. The cars look as they did around 1959. Model: The powered rail car has an mfx digital decoder. It also has controlled high-efficiency propulsion with a flywheel, mounted in the motor car. Both axles on the motor car are powered. Traction tires. The motor car and trailer car have factory-installed interior lighting. The triple headlights and dual red marker lights on the motor car change over with the direction of travel; they as well as the interior lighting will work in conventional operation and can be controlled digitally. The headlights and interior lighting are maintenance-free warm white LEDs. The red marker lights on the motor car can be turned off on End 2 facing the trailer car. As in the prototype, the trailer car has no headlights. There is a current-conducting drawbar coupling with guide mechanisms between the two cars. The cars have interior details. There is a clear view in the motor car and the trailer car. There are separately applied ladders on the motor car. Length over the buffers for the two-car set 28.1 cm / 11-1/16". Road numbers: VT 75 903 and VB 140 036. After the first success with 2-axle, lightweight powered rail cars for branch lines, different firms delivered additional 2-axle units of different designs and performance to the German State Railroad Company (DRG) from 1932 on. 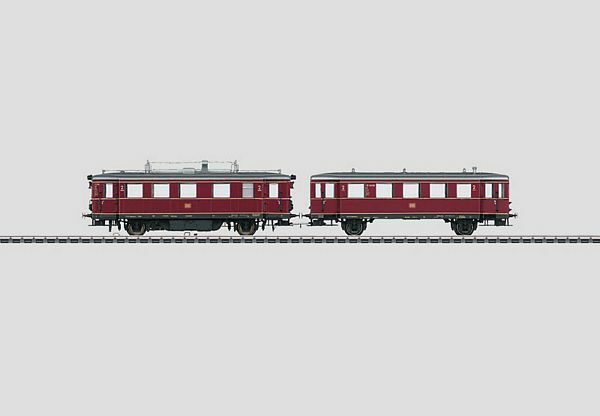 The firm Waggonfabrik Bautzen built three series of diesel mechanical powered rail cars between 1933 and 1935. These units differed from one another only in small details. While the first series delivered (road numbers VT 135 002-011) had riveted frames and car bodies, the second series (road numbers VT 135 022-031) made use increasingly of welding technology. On the third series (VT 135 051-060) the frame and car body were assembled completely by the use of welding. Appropriate trailer cars as road numbers VB 140 032-047, 097-122 as well as 230-249 were delivered almost at the same time in three production groups. The first powered rail car series originally ran with a 120 horsepower Daimler diesel motor, later with the same type of motor as the two other groups, a Daimler motor with 135 horsepower. With one exception the motor extended into the car body on all of the powered cars and was covered by a folding back seat. On all three series a proven mechanical power transmission system was used in the form of a four-speed, pressure-activated gear change and gear reverse transmission from the firm of TAG. After the end of the war the DB took over cars from all three series and designated them from 1947 on as the class VT 75.9. Starting in the mid-Fifties all of the class VT 75.9 units were based at Regensburg and were even equipped with new Deutz type A 6 M 617 motors with 130 horsepower such as were used on small locomotives in Performance Group II. Of the original 16 cars re-classed by the DB there were still eleven on the roster at the start of 1960. Nine of them were retired by the DB in April and May of 1960. The last two VT 75.9 cars were not retired until March 30, 1962 at the Schwandorf maintenance center. The East German DR after the end of the war had by contrast only one powered rail car on their roster: Road number VT 135 054 (from 1970 on 186 257) was later rebuilt into a salon car at the maintenance center in Magdeburg and is now part of the museum inventory and can be found at the maintenance center in Stassfurt.